What types of businesses, organizations, facilities or agencies should have emergency evacuation chairs available in the case of a crisis situation? An emergency evacuation chair or several chairs are an important consideration for a wide range of different types of organizations, business and public or private settings. These chairs are much easier to get individuals in and out of than a wheelchair and they are far easier to maneuver than a bulky wheelchair. This also makes them much easier to store in a medical supply room or even a first aid closet in a building, school, high rise or any other type of public place. Emergency evacuation chairs are particularly important in larger office or high rise buildings and apartment buildings where emergency access may limited in the event of a fire or other type of disaster. If elevators are not available traditional wheelchairs and stretchers are very difficult to maneuver through narrow hallways and down staircases. However, this is particularly what the emergency evacuation chair has been designed to handle. Easily pushed from the back or the front, making it easy to move up and down stairs, this is an important consideration for the safety and security of virtually all public and private buildings with elevators or staircases or with small, compact areas that make the use of other types of medical equipment problematic. 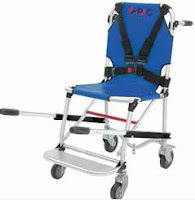 What is the advantage of using an emergency evacuation chair in transporting a patient or injured individual? chair can also be controlled from the back. Unlike a wheelchair the wheels are very small, no more than 7.5 inches in size, so they easily fit on all standard stair steps. Many models have wheels only on the rear legs, ensuring that the chair remains securely in place when not in motion. Locking devices on rear wheels provide additional security when transporting a patient. What safety features are available on the chairs to ensure that the individual being transported is as safe as being on a stretcher or in a standard wheelchair? The secure frame and locking wheels provide stability to the emergency evacuation chair, very similar to the solid and durable construction found with medical stretchers and wheelchairs. Like a stretcher the emergency rescue evacuation chair also has one or two straps that are used to secure the patient into the chair. Some models use two standard automobile or airplane style seat belt straps, one that goes across the chest just under the shoulders and one that goes across the thighs just below the hips when seated. This ensures that the patient's arms, legs and body are securely on the chair. Another system to secure the patient in the rescue chair is the use of a harness style security strap system. There are two straps, one on each shoulder, that come down the chest and fasten to one side of the standard type of auto seat belt that then clips fastens in the middle.